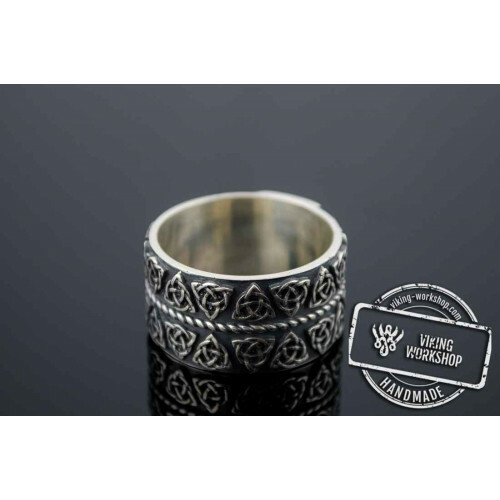 Celtic Ring with Triquetra Symbols Sterling Silver Pagan Jewelry Unique handmade ring Made-to-order (you'll get the ring which is made individually with your size) Branded box Worldwide shipping + Tracking number Careful packaging Meta..
Triquetra Symbol Ring with Blue Cubic Zirconia Sterling Silver Celtic Jewelry Unique handmade ring Made-to-order (you'll get the ring which is made individually with your size) Branded box Worldwide shipping + Tracking number Careful packaging..
Triquetra Symbol Sterling Silver Ring Unique handmade ring Made-to-order (you'll get the ring which is made individually with your size) Branded box Worldwide shipping + Tracking number Careful packaging Metal: 925 silver, sterling silv..
Celtic ornament ring is a unique gift for a real man In those days, the amulets and rings had a unique pattern featuring a complex knot. It was believed that if you put on such an adornment, you can win any battle. It also kept healthy and shielded .. 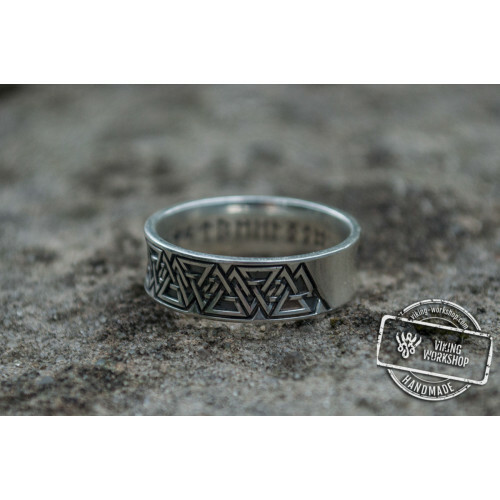 Unique Handcrafted Ornament Ring Sterling Silver Viking JewelryUnique handmade ringMade-to-order (you'll get the ring which is made individually with your size)Branded boxWorldwide shipping + Tracking numberCareful packagingMetal: 925 silver, sterlin..
14K Gold Valknut Symbol Norse Ring Unique handmade ring Made-to-order (you'll get the ring which is made individually with your size) Branded box Worldwide shipping + Tracking number Careful packaging Metal: 14K gold Weight: approx. 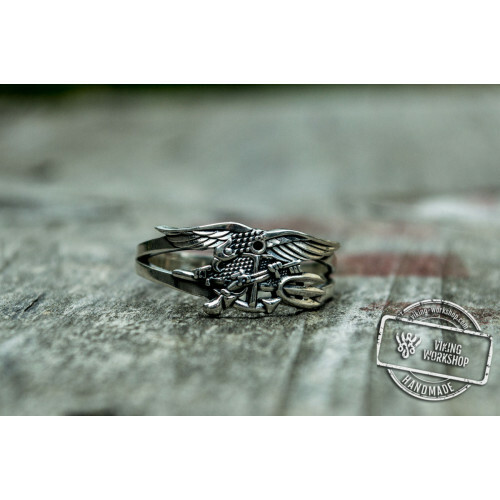 5 ..
Navy Seals Eagle Trident Ring Sterling Silver Handcrafted Jewelry Unique handmade ring Made-to-order (you'll get the ring which is made individually with your size) Branded box Worldwide shipping + Tracking number Careful packaging Meta..
Ring with Helm of Awe Symbol and Wolf Ornament Gold Viking Jewelry Unique handmade ring Made-to-order (you'll get the ring which is made individually with your size) Branded box Worldwide shipping + Tracking number Careful packaging Met..
Ring with Helm of Awe Symbol and Wolf Ornament Sterling Silver Viking Jewelry Unique handmade ring Made-to-order (you'll get the ring which is made individually with your size) Branded box Worldwide shipping + Tracking number Careful packaging..
Ring with Heraldic Lilia Sterling Silver Handcrafted Jewelry Unique handmade ring Made-to-order (you'll get the ring which is made individually with your size) Branded box Worldwide shipping + Tracking number Careful packaging Metal: 92..
Ring with Valknut Symbol Gold Viking Jewelry Unique handmade ring Made-to-order (you'll get the ring which is made individually with your size) Branded box Worldwide shipping + Tracking number Careful packaging Metal: 14K or 18K Weight..
Ring with Valknut Symbol Sterling Silver Viking Jewelry Unique handmade ring Made-to-order (you'll get the ring which is made individually with your size) Branded box Worldwide shipping + Tracking number Careful packaging Metal: 925 Ste..
Valknut Symbol Ring Sterling Silver Viking Jewelry Unique handmade ring Made-to-order (you'll get the ring which is made individually with your size) Branded box Worldwide shipping + Tracking number Careful packaging Metal: 925 Sterling..
Valknut Symbol Ring with Blue Cubic Zirconia Sterling Silver Handmade Jewelry Unique handmade ring Made-to-order (you'll get the ring which is made individually with your size) Branded box Worldwide shipping + Tracking number Careful packaging..
Valknut Symbol Ring with cubic Zirconia Sterling Silver Viking Jewelry Unique handmade ring Made-to-order (you'll get the ring which is made individually with your size) Branded box Worldwide shipping + Tracking number Careful packaging .. 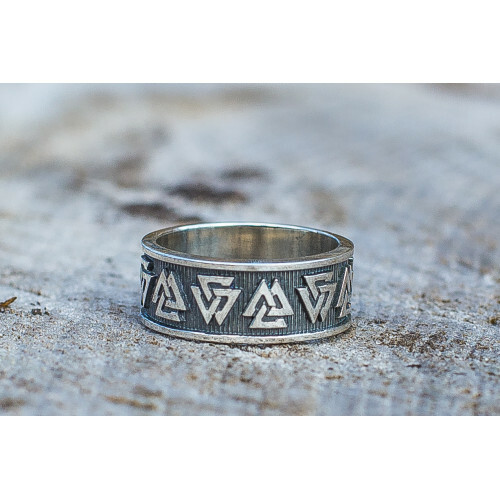 Stylish Trikvetra pendant - a perfect accessory for the everyday image of a man or womanTriquetra Celtic Symbol Sterling Silver Pendant Stylization viking-workshop can rightly be called a universal purchase or gift. And all thanks to the Triquetra sy.. 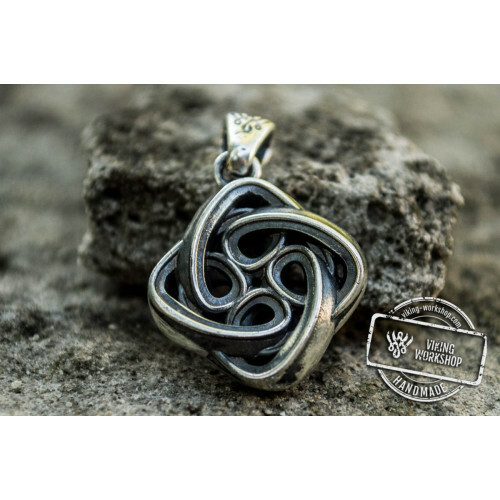 Unique Pendant with Triskel Spiral Sterling Silver Celtic JewelryUnique handmade pendantMade-to-order (you'll get the pendant which is made individually)Branded boxFree 700 mm cordWorldwide shipping + Tracking numberCareful packagingMetal: 925 silver.. 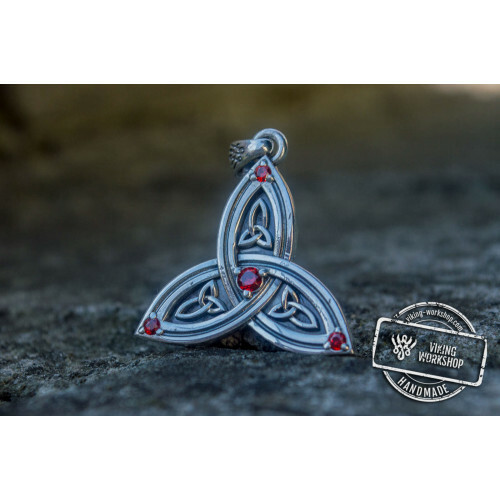 The variety of the Celtic heritage in an original pendant from the professionals of Viking-Workshop storeThe Celts, who lived before our era, were very remarkable people and are still a point of interest for modern day archaeologists, as well as for ..
Celtic Knot Ornament Sterling Silver Pagan PendantUnique handmade pendantMade-to-order (you'll get the pendant which is made individually)Branded boxFree 700 mm cordWorldwide shipping + Tracking numberCareful packagingMetal: 925 silver, sterling silv.. Flower of Life Pendant Sterling Silver Unique JewelryUnique handmade pendantMade-to-order (you'll get the pendant which is made individually)Branded boxFree 700 mm cordWorldwide shipping + Tracking numberCareful packagingMetal: 925 silver, sterling s..
Pendant with Cross and Ornament Sterling Silver JewelryUnique handmade pendantMade-to-order (you'll get the pendant which is made individually)Branded boxFree 700 mm cordWorldwide shipping + Tracking numberCareful packagingMetal: 925 silver, sterling.. Unique Handmade Geometry Pendant Sterling Silver JewelryUnique handmade pendantMade-to-order (you'll get the pendant which is made individually)Branded boxFree 700 mm cordWorldwide shipping + Tracking numberCareful packagingMetal: 925 silver, sterlin.. Unique Handmade Geometry Pendant Sterling Silver Viking JewelryUnique handmade pendantMade-to-order (you'll get the pendant which is made individually)Branded boxFree 700 mm cordWorldwide shipping + Tracking numberCareful packagingMetal: 925 silver, ..
Celtic Triquetra Symbol Sterling Silver Pendant StylizationUnique handmade pendantMade-to-order (you'll get the pendant which is made individually)Branded boxFree 700 mm cordWorldwide shipping + Tracking numberCareful packagingMetal: 925 silver, ster..
Triquetra Symbol Pendant with Red Cubic Zirconia Sterling Silver Celtic JewelryUnique handmade pendantMade-to-order (you'll get the pendant which is made individually)Branded boxFree 700 mm cordWorldwide shipping + Tracking numberCareful packagingMet..
Triquetra Symbol with Runes Sterling Silver Celtic PendantUnique handmade pendantMade-to-order (you'll get the pendant which is made individually)Branded boxFree 700 mm cordWorldwide shipping + Tracking numberCareful packagingMetal: 925 silver, sterl..
Feel the new breath we’ve given to the authentic Irish jewelry adding a touch of modern design elements. Our goal was to find a compromise between those in search for traditional visible symbolism and those who would rather hint about their belonging or affection to the ancient culture. 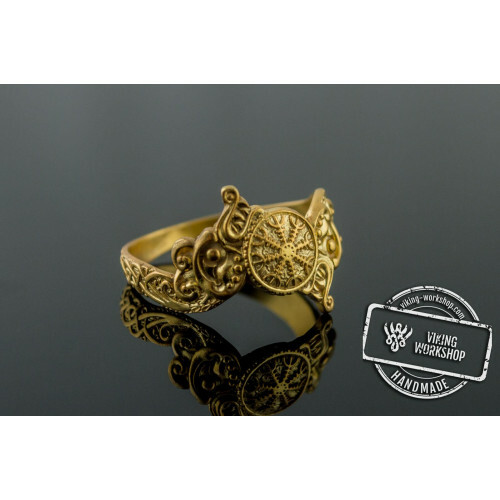 We would like to introduce you to our stunning handcrafted collection of Celtic jewelry from Ireland. In the necklace line, we paid significant attention both to the aesthetic part and the comfort for everyday wear. Our designers created simple from the first sight, deeply attached to the Irish culture pieces for men and women. · The classic sterling silver Celtic cross on a leather cord necklace to emphasize your masculinity traits, bravery, and dedication. · Sterling silver necklace with a green shamrock made of world-famous Connemara marble to endow you with Irish luck. 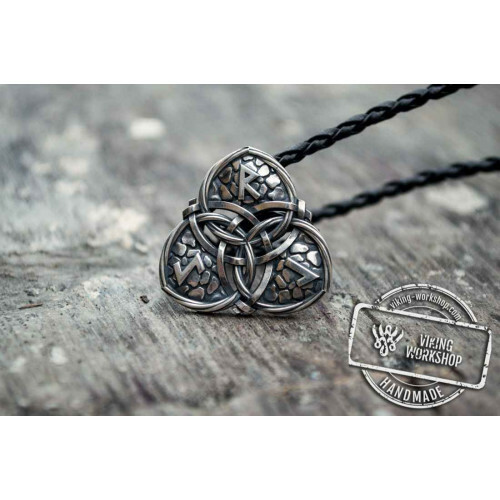 · Black triquetra necklace for a strict casual or business look. · Sterling silver pendant with intricate Celtic knotwork. · Gold classic Claddagh necklace, a visual symbol of love, friendship, and loyalty. · Sterling silver pendant with the Irish tree of life to preserve the inner harmony and balance. We offer a unisex personalized necklace with any word of your choice written in Ogham script on a silver plate. All of our necklaces are adjustable for your comfort. Leave it to dangle or put it tight depending on your mood and chosen style. Ladies would definitely love our gorgeou earrings collection distinctive for its variety of designs. 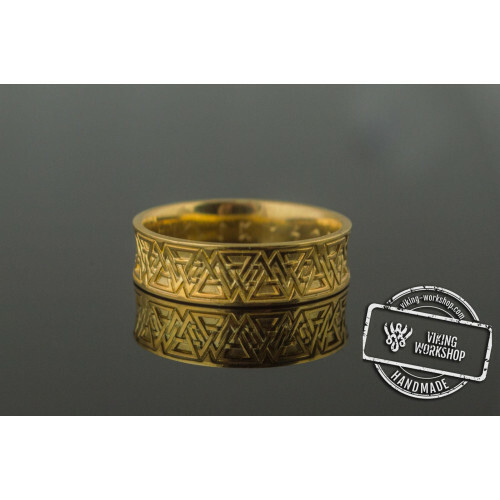 Delicately combining authentic knotwork in sterling silver or solid gold with diverse gemstones, we provide you with an opportunity to emphasize your individuality selecting the stone of your favor. 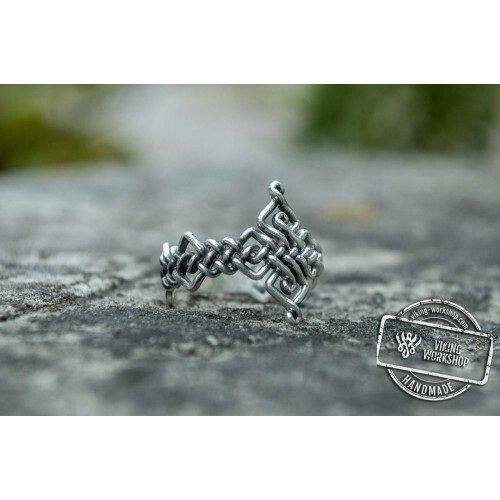 Celtic knot earrings would be a perfect choice for a gift. Deep blue sapphires or green Connemara marble to accentuate her eyes, shiny diamonds to compliment her dazzling beauty or you can choose her birthstone in order to show you understand and appreciate her character.Our paying tribute to the Irish heritage by preserving traditional ornaments in jewelry will give you an impression of its ancient Celtic origin. Our handmade Celtic knot bracelets are a good choice for everyday look perfectly combining with any type of clothing. The ability of variations in designs is aimed at reflecting your personal emotions and feelings. You can choose the strict leather bracelet with gold charms, Connemara marble bangle or a sterling silver knot one. Explore the diversity of our Irish bracelets range and bring a genuine flavor of Ireland into your everyday image. 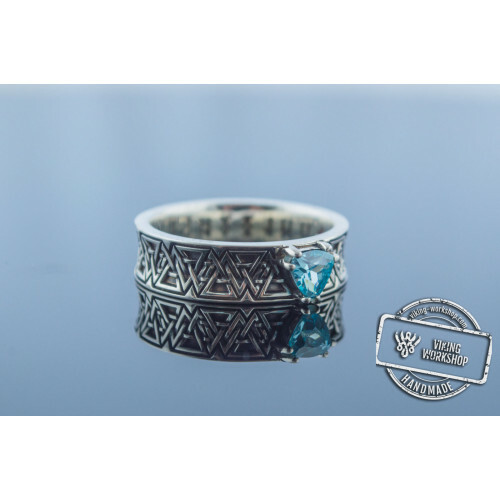 Either you want to treat yourself or to find a gift for your beloved; in our online store, you would find a piece suiting every taste. 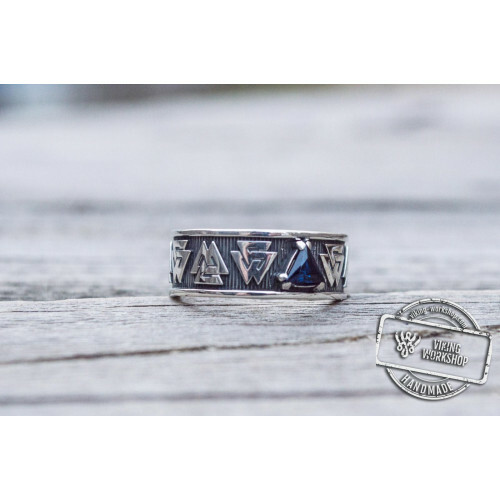 Remember that we do the custom work, which means you can add an individual touch to the chosen jewelry.